Not only are you pulled in eight different directions, you entered into a competitive market and you’re challenged with finding a way to stand out among the noise. You have limited resources whether it be time, employees, or budget and are feeling unproductive by switching gears all day long. But it’s not all doom and gloom—there’s good news! Why does it matter? Providing an outstanding experience not only boosts your business reputation compared to your competitors, it also improves your customer retention rate. In addition, things are bound to break in the startup world and you can’t afford to provide anything other than top-notch service when there are issues—and when you do have issues, your customers have expectations. Three in 10 customers expect a reply to an email within an hour—one hour! So customer service is important and expectations are high, but you’re the little guy. How are you supposed to provide a first-class experience with your constrained resources? These customer service qualities aren’t exclusive to the big guys with big budgets. As a startup, you can provide great customer service too and you should! Most of your customers are reasonable beings, they know that issues aren’t going to be solved at the snap of a finger. What they do expect, however, is timely communication with an accurate timeline of when they can expect their solution. Here are seven ways to communicate realistic expectations and provide big business customer service as a startup. Live chat software is an inexpensive way to add another communication channel option for your customers or site visitors. But what if you don’t have someone to man your chat tool 24/7? Setting up automated messages is your answer. However, do not try to fool your visitors into thinking they’re chatting with a human. They’re smarter than that. What you can do is represent your presence via chat while also setting expectations on how long until they can expect a response from someone. Answering services are another affordable way to capture all of your inquiries around the clock. At PATLive, we charge a monthly fee based on how many minutes you use and the virtual receptionists answer the calls based on a script that you provide. Your callers will have peace of mind that they’re speaking with a live human, even if this means they don’t receive an instant solution. They can also ensure that you aren’t missing any important sales opportunities. Providing around the clock phone support makes your startup look and feel like a bigger, established brand. Do you have a way for your customers to serve themselves? Customers are more tech-savvy than ever and sometimes prefer to take action alone instead of contacting support. Establishing a self-serve library, knowledge base, or robust FAQ page takes time up front but saves you time in the end by reducing redundancies. Providing an online knowledge base scales your customer support and allows your customers to find a solution without ever having to contact your company—score! 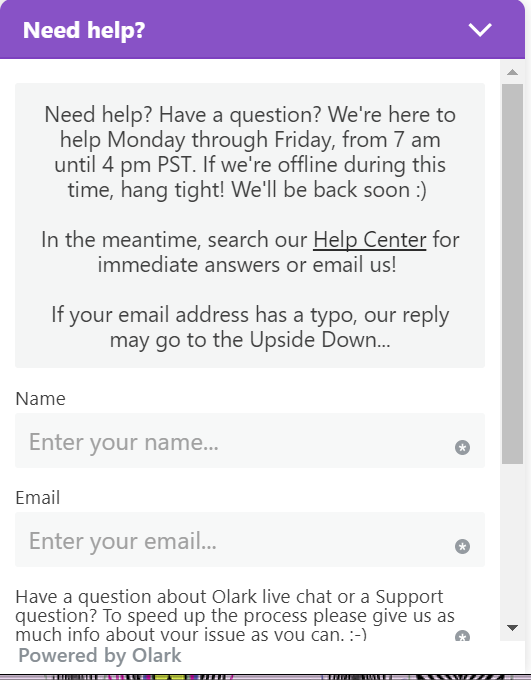 You’ll notice in the above after-hours Olark live chat example, they list a link to their knowledge base so that users can serve themselves in the meantime. A Net Promoter Score survey gathers customer feedback and measures customer loyalty. It’s a fantastic way to get your hands on meaningful, constructive insight into your service so that you can make necessary adjustments and even follow up on specific service issues. At PATLive, we do an NPS Survey every six months, and every time we find that it provides us with the opportunity to retain accounts that had something happen but hadn’t let us know. Good feedback is gold and asking for it is a proactive way to show that you care and gain the knowledge that will lead you to improve your operations in ways you hadn’t thought about. If you invest time to onboard new customers or clients with all the information they could ever need, you may save yourself support inquiries in the future. In addition to a knowledge base, having materials like FAQs, forums, and how-to videos available is a great way to provide your customers with the tools to self-serve and gain a level of comfort with your company right off the bat. 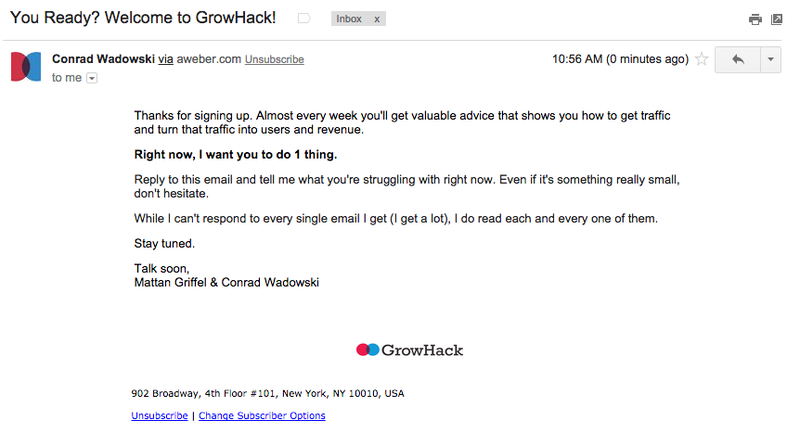 As a startup, personalization is where you can really shine. Hate when you get emails from big businesses with generic content that doesn’t even apply to you? Everyone does. Automatic emails can still be personal. Look at this email from GrowHack. Right off the bat, you receive a plain text email from the two partners who want to know what you’re struggling with. That’s a welcome email with a personal feel, you’ve just signed up and they’re already addressing your pain points. 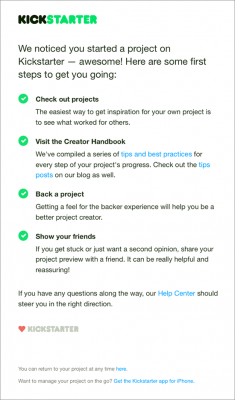 Lucky for you, as a startup you’re starting fresh! You’re able to establish a customer-centric culture early on, if you commit to learning to do it right. In other words, you’re not Comcast with a bad reputation and bad process and a mountain of a comeback to make. Although you’re handling a portion of the support now, as you expand you’ll be able to hire and train employees to take care of your customers just like you would. Being a startup doesn’t mean that you can’t provide big business service. In a lot of ways, you have an opportunity to provide an even better experience than an enterprise-level company can, making you a fierce competitor. Filling out a generic inquiry form with no glimmer of hope on the horizon is a bad experience. By utilizing customer service tools, onboarding and educating your customers, asking for feedback, and setting realistic expectations, you can be a customer service superstar. Jamie is the Channel Relations Manager for PATLive. PATLive is a 24/7 live answering service that answers calls for thousands of businesses nationwide. She specializes in educational content based on improving customer service and the overall customer experience.